WTTW, Chicago's premier public television station, will broadcast Hoop Dreams at 8pm on Thursday, June 23rd as part of a year-long series honoring our 50th anniversary. This special broadcast of our most celebrated film - the first time it has aired on WTTW since its original 1995 PBS national broadcast - precedes our #KTQ50 Birthday Party at the Harris Theater on Friday, June 24, at which the film's stars William Gates, Arthur Agee and Sheila Agee will be among the special guests, along with Hoop Dreams director Steve James and several hundred more Kartemquin filmmakers, subjects, alumni, and fans. Ahead of the broadcast and the party, Steve James spoke to The Criterion Collection about making the film and his thirty-year association with Kartemquin. Originally conceived of as 30-minute short film for PBS, Hoop Dreams follows the lives of William Gates and Arthur Age over the course of their formative and tumultuous high school lives. Plucked from the streets and given the opportunity to attend a suburban prep school and play for a legendary high school coach, William Gates and Arthur Agee both soon discover that their dreams of NBA glory become obscured amid the intense pressures of academics, family life, economics, institutionalized racism, and athletic competitiveness. Despite this, no matter how hard tragedy strikes or how desperate their situation becomes, both boys remain focused on their dream and hold onto basketball as the means by which they are able to navigate their impossibly difficult journey to adulthood. It is their faith in the game that unites their family and gives each person hope, and it is this faith that ultimately allows them to build upon their failures as well as their triumphs and make for themselves a potentially better life. This seminal documentary went on to win numerous other awards, taking home every major critics award in 1994 as well as a Peabody and Robert F. Kennedy Journalism Award in 1995. The film also earned Steve James the Directors Guild of America Award and the MTV Movie Award’s "Best New Filmmaker." Hoop Dreams was subsequently named to the Library of Congress's National Film Registry, signifying its enduring importance to the history of American film. 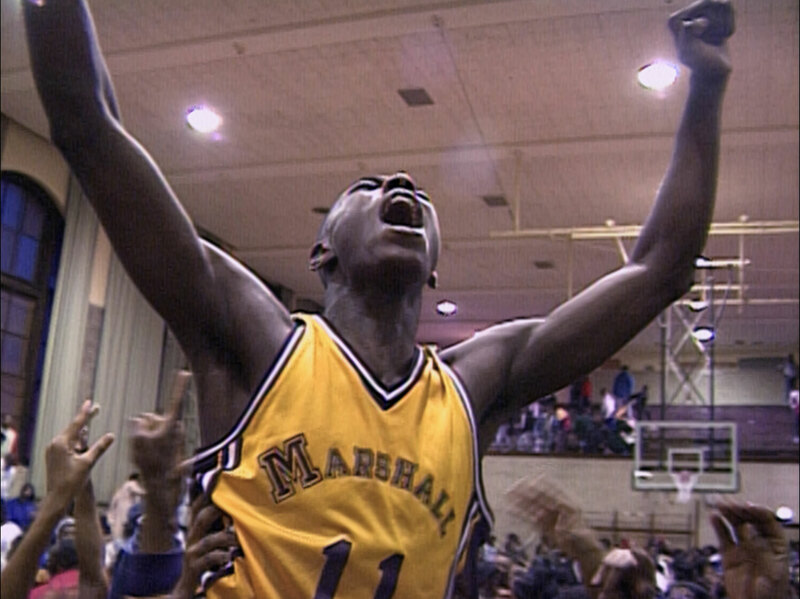 Many critics called Hoop Dreams the best film of 1994 and the best film of the decade, such as Roger Ebert who called the film “one of the great moviegoing experiences of my lifetime.” In addition, it has often been voted the greatest documentary of all time. The Criterion Collection recently released a completely restored version of Hoop Dreams on Blu-ray for the first time, available now in our store. After seeing the Criterion Blu-ray, director Steve James said that “this new restoration actually looks better than the film ever did…you could argue that this is really the first time you will ever have seen it as it was truly intended.” Extra features included on the Blu-ray include an audio commentary by filmmakers Peter Gilbert, Steve James, and Frederick Marx, an audio commentary by the film’s subjects, Arthur Agee and William Gates, "Life After Hoop Dreams" (a new documentary catching up with Agee, Gates, and their families), and additional scenes, never before released to the public. Coming up next in the WTTW monthly broadcast series include the broadcast premiere of the award-winning Almost There (2014), about two filmmakers’ complicated relationship with a reclusive elderly outsider artist, airing on July 7th at 9pm. In August, WTTW will air The Chicago Maternity Center Story (1976) a film that interweaves the history of a maternity center with the stories of a young woman about to have her first baby and the center's fight to stay open in the face of the corporate takeover of medicine. Then in September, WTTW will air The Last Pullman Car (1983), a film about Pullman workers in the midst of a fight not only for their jobs but the future of the American railcar industry. Other highlights of Kartemquin’s 50th anniversary year include several retrospectives and screenings in Chicago and nationwide; an exhibition; a book; workshops, panels, and master classes; and online streaming of the organization’s entire catalog of award-winning documentaries via http://watch.kartemquin.com. The full calendar, which will be updated throughout the year as new events and partners are added, is available at www.KTQ50.org Join the conversation on Twitter at @Kartemquin or by using #KTQ50.